Stadig nye kamera kommer i hyllene med AVCHD formatet. Ikke overraskende fikser siste versjon av Sony Vegas redigering umiddelbart. Men om vi ikke har den tilgjengelig...? 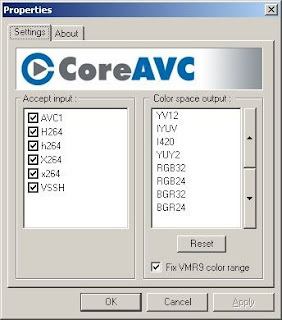 -CoreAVC is a H.264 video codec created by CoreCodec. CoreAVC is based on the MPEG-4 Part 10 standard and is one of the codecs used in Blu-ray (BD) and in High Definition DVD (HD-DVD). AVC/H.264 is the next-generation standard for video, and CoreAVC is being recognized as one of the worlds most efficient H.264 video decoders. The efficiency of CoreAVC in software is often compared to be faster than other solutions that try to rely on 'hardware' to increase playback performance of H.264 video. Lagt inn av Bloggerguy kl. 8:18 p.m.